Spotify has launched its long-awaited app for the Apple Watch. This allows Apple Watch owners who subscribe to Spotify to control what’s playing without having to wrestle their iPhone out of their pocket. Which is invaluable when you’re on the move. When Apple first unveiled the Apple Watch How The Apple Watch Won Me Over How The Apple Watch Won Me Over When Apple announced their latest gadget, I wasn't entirely impressed. I ignored the hype, disregarded the reviews, and didn't pre-order one for myself. Obviously, I caved. Read More , many of us wondered what the point was. Here was a glorified timepiece that essentially just saves you from having to get your phone out of your pocket so often. And while that’s still true, there’s some value to that. Spotify’s new Apple Watch app demonstrates that value. It lets you control your favorite music and podcasts without having to fish your phone out of your pocket. Which, while not life-changing, is certainly useful when you’re out and about and/or have your hands full. Spotify for Apple Watch lets you play and pause the song currently playing, skip to the next track, rewind 15 seconds while listening to a podcast, and save a new favorite track by tapping the Heart icon. It can also connect to other devices using Spotify Connect. The Spotify app for Apple Watch is officially live, but will be rolling out to Apple Watch users over the next week or so. To access the Apple Watch app you’ll need to have the latest version (v.8.4.79) of Spotify installed on your iPhone. This is clearly just the first version of the app, with Spotify promising new features are on the way. 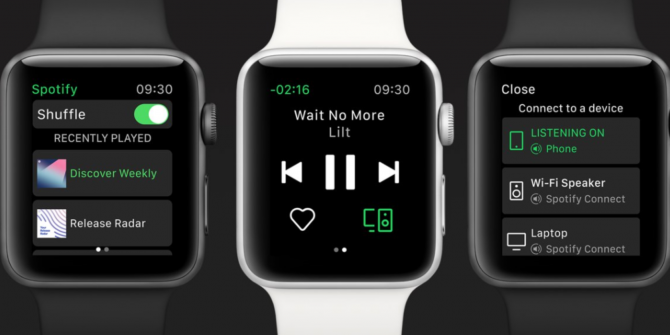 Still, for Apple Watch owners who prefer Spotify to Apple Music, this is a match made in Heaven. After all, haven’t you always wanted to DJ using your watch?! Spotify users should check out our unofficial guide to Spotify Spotify Music Streaming: The Unofficial Guide Spotify Music Streaming: The Unofficial Guide Spotify is the biggest music streaming service around. If you're not sure how to use it, this guide will walk you through the service, as well as offer some crucial top tips. Read More or our pick of playlists to beat the winter blues The 15 Best Spotify Playlists to Beat the Winter Blues The 15 Best Spotify Playlists to Beat the Winter Blues This selection of winter-themed Spotify playlists should help keep your good mood high through the cold winter months. Read More . And if you own an Apple Watch you should learn how to watch music videos on your Apple Watch How to Watch Music Videos on Apple Music How to Watch Music Videos on Apple Music Apple has added thousands of music videos to Apple Music. We'll show you how to access these music videos and create your own "music TV" channels on Apple Music. Read More or learn how to change your Apple Watch face How to Customize Your Apple Watch With Watch Faces How to Customize Your Apple Watch With Watch Faces All Apple Watch users should customize their watch face. Here's how to change your Apple Watch face, add complications, and more. Read More . Explore more about: Apple Watch, Spotify, Streaming Music.